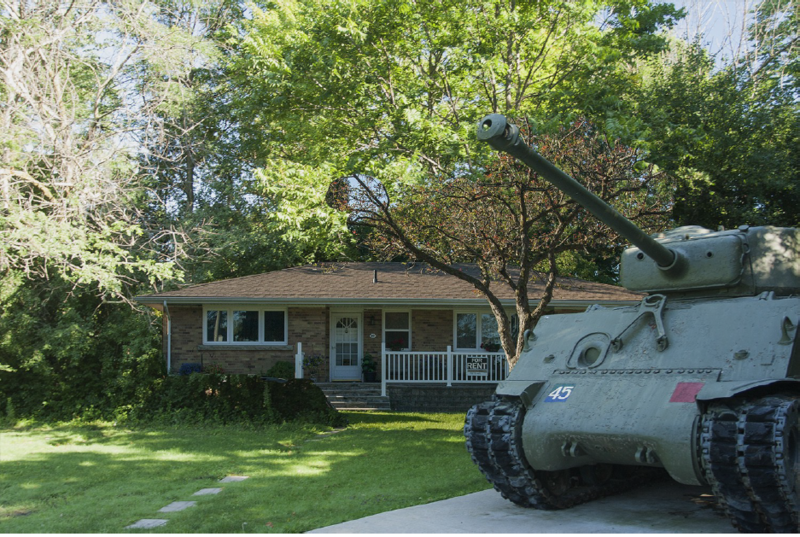 Artist Paola Poletto set out to photograph postwar homes for sale in a one kilometre square section of north Toronto known as Willowdale with the intention of returning to re-photograph the various sites after they were sold. Her goal was to combine the images of the older homes before their demolition (a.k.a. the “Ghost”) with the newer and much larger multi-level Neo-Eclectic replacement house (a.k.a. the “Monster”) that would inevitably assert their position on the various sites explored. This resulted in a series of 6 composite images overlaying the two types of homes on top of one another. The project set out to reflect the diversity of settlers, represented by their domestic architecture. The absence of bodies in these photographs avoids documentary as an endpoint. It is impossible to see neither ghosts nor monsters when viewing the source images independently. But when they are superimposed as a photocollage, we enable our imaginative eye to see into fluctuating and impermanent worlds that surround us every day. Indeed, a narrative that disrupts the idea of the colonial “heritage home” is also implied. And Willowdale’s most commonly used languages —English, Chinese, Farsi and Korean—are preset alongside the photo collages within the bookwork, considering multiple voices through the process of translation. Paola Poletto’s work shifts between DIY and institutional-based practice. Comfortable in both artistic and creative paradigms, she is consistently fascinated with representations of collaborative productions where visual constructions are transformed into rigorous narratives that express multiple points of view. Paola’s independent practice includes photography, bookmaking, installations and project management. She is the independent curator of several art/lit projects which include: Kiss Machine (2000-5), Inflatable Museum (2001), Girls and Guns (2004), Boredom Fighters! (2008), Tel-talk: art interventions in telephone booths (2012) and Oh Dear: public art (2013). Ghosts of Monsters is produced by Paola Poletto with Flavio Trevisan, Brendan George Ko and Paul Hong. Writer Paul Hong contributes a speculative fiction set amongst the urbanscapes explored, photo-based artist Brendan George Ko worked with Paola to create the photo collages, and artist and founder of Hex Editions, Flavio Trevisan, collaborated on the design and production of the bookwork, PARKHOME, for OOL imprint.